THE WALKING TOUR RUN ACCORDING TO WEEKLY AGENDA. YOU MUST CHECK THE TOUR STATUS AND SCHEDULE. WHAT DOES THIS MESSAGE MEAN: “THE DATE IS NOT ON THE AGENDA”? THE TOUR INFORMATION FOR THE DATE IS NOT AVAILABLE YET. YES, RESERVATIONS FOR THE FREE AND SELECT TOURS ARE NECESSARY TO OBTAIN THE NOTIFICATION AND THEN THE CONFIRMATION. RESERVATIONS SUBJECT TO AVAILABILITY AND UPON REQUEST BY FORM ON OUR WEBSITE. HOW DO I KNOW MY RESERVATION REQUEST IS CONFIRMED? HOW CAN I CANCEL MY RESERVATION REQUEST? YOU CAN CANCEL A RESERVATION REQUEST OR CHECK THE TOUR STATUS BY ENTERING THE RESERVATION REQUEST ID AT THE STATUS FORM ON OUR WEBSITE. THE FREE TOUR IS APROXIMATELY 2 HOURS LONG. ABSOLUTELY! YOU COULD DO A TOUR IN THE MORNING AND THE OTHER IN THE AFTERNOON. IS THERE A MAXIMUM NUMBER OF PEOPLE ALLOWED ON A TOUR? YES, THERE IS MAXIMUM NUMBER OF PEOPLE FOR TOURS. RESERVATIONS ARE REQUIRED SO THAT WE CAN BE SURE TO HAVE AN APPROPRIATE NUMBER OF STAFF MEMBERS AT THE TOUR STARTING POINT ON THE GIVEN DAY. ALL THE TOURS CONTAIN A FEW INCLINES AND UNEVEN TERRAIN, AND THEY LAST FOR AT LEAST 2 HOURS. DESPITE THIS, THEY ARE ALL MANAGEABLE BY WHEELCHAIR AS LONG AS ONE IS ACCOMPANIED BY AN ABLE-BODIED CARRIER. WHAT TIME DO I NEED TO SHOW UP FOR MY TOUR? WE PREFER YOU GET THERE AT LEAST 15 MINUTES BEFORE THE START TIME. DO THE FREE TOUR INCLUDE THE ENTRANCE FEES TO THE PLACES OF INTEREST? 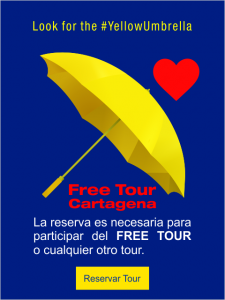 **** FREE TOUR CARTAGENA IS NOT RESPONSIBLE FOR ACCIDENTS, LOSSES, THEFTS OR ANY OTHER UNEXPECTED EVENT THAT MAY HAPPEN DURING THE TOURS. **** OUR GUIDES RESERVE THE RIGHT TO ADMISSION TO THE TOURS TO ANYONE IF THEY CONSIDER IT NECESSARY. **** TOURS HAVE SPECIFICATIONS AND RECOMMENDATIONS. FREE TOUR CARTAGENA WON’T BE RESPONSIBLE IF THEY ARE NOT FOLLOWED CORRECTLY.